After three straight nights of parties and dinners, it is nice to sit and relax at home for a change. The kids are settled in bed -- well, sort of -- and I’m getting on with beer number nine in the 40b40 challenge. 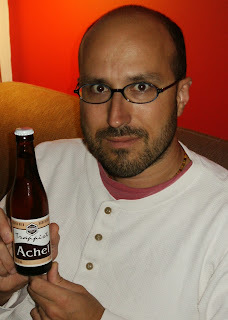 It’s Achel tonight, a Trappist product from the Abbey of Saint Benedict – De Achelse Kluis in Flanders. This is a new one for me: yet another beer and brewery I hadn’t even heard of a few weeks ago. I’ve got the blond here, which comes in a 33cl bottle with a delightfully simple yet elegant label. The pour reveals a soft amber ale. The taste is initially a light dry floral through a strong first fizz, evolving into bitter hoppiness that merges with the alcohol (8%) for a lasting flavour. Apparently, Achel is the youngest Trappist brewery, but these Cistercians clearly don’t want for experience. This is a nicely balanced beer and one I could easily come back to. I’d like to visit the abbey someday actually. They have the only brewpub within a monastery anywhere in the world. Worth a trip that.